This herb and melon smoothie is super easy and packs a punch in terms of nutrient diversity and potential gut microbiome enriching prebiotics. This is made possible by all the different herbs and additional ingredients like melon seeds, banana and nutritional yeast. Added to this is the benefit of the medicinal properties of cancer and inflammation fighting turmeric, and blood pressure lowering cinnamon, which is also used to bring on healthy sleep patterns in our local traditional medicine. My husband who is the main author of this website has urged me to document my new concoctions, so this is down to him ! Most of my smoothie recipes are built on a sweet sour foundation, with vinegars, fruit acids and fruit sugars contributing the strong flavours, but this one I found much more unique, subtle and multidimensional. 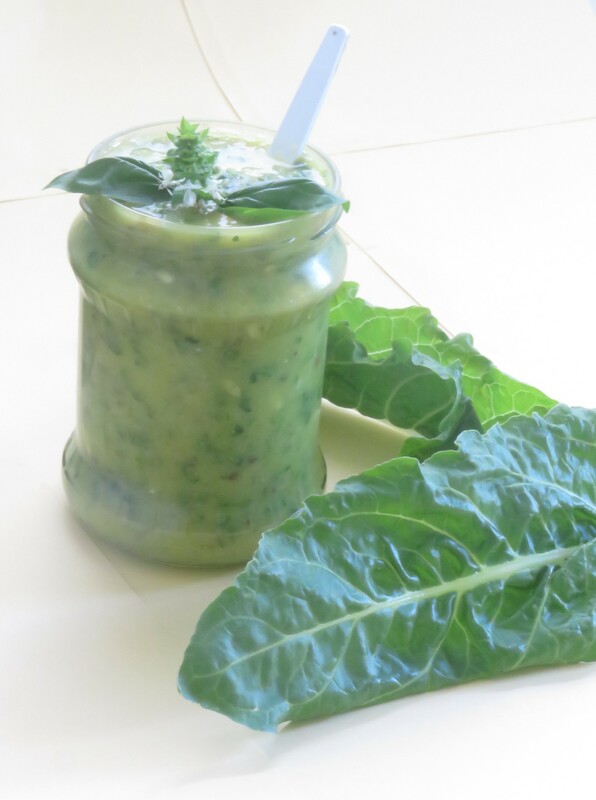 The herb and melon smoothie also contains a lot of fresh ingredients from the garden. My husband and I share planting and maintaining the garden which is the source of all these easy to grow herbs. I describe how to grow most of them on my website. See the garden link below the section on tinnitus and Meniere's disease. Reduce the first group of ingredients to powder in a coffee grinder. Add them to the rest in a robust blender and blitz until most of it is creamy with some coarser chunks in it. Our long winding road to herb and melon smoothie making started a while back when I was on a re-myelination protocol to heal the tinnitus caused by Meniere's Disease. The protocol was designed for smoothies as a base for administering nutrients. A lot of the fats and amino acids needed for building myelin are from seafoods, organ meats and the like. Not exactly nice in a smoothie with fruit, not for average tastes anyway. The fats and amino acids therefore had to be supplied from nuts as a source. Unfortunately, food medicine is so complex, the nut butters in the protocol, rich in Arginine, probably worsened the condition by supporting the replication of the HPV virus that reputedly causes Meniere's. After the last bout I went on with the program of pumping myself full of nutrients and the big dose of B vitamins in yeast, but dropping the nut butters. I feel very much recovered, almost in remission. Peanut butter is bad for me. This is all fringe doctoring. My ENT specialist gives me a quizzical look if I mention the topic of special diets, but he knows there is no mainstream cure. He put in a grommet and injected plenty of steroids into the inner ear, which may have saved my hearing. That is enough to be very grateful for. He is such a patient man and working in public health in South Africa. I cannot imagine any job more stressful if you care about people.